UMass is the third largest research university in the state. The University of Massachusetts at Amherst is our state’s flagship university, meaning it is our largest, most selective public institution with the greatest variety of programs. Academic options span the colleges of agriculture, education, engineering, humanities and fine arts, information and computer sciences, natural sciences, nursing, social and behavioral sciences, management, public health and health sciences, and an honors college. UMass Amherst is part of the Five College Consortium, so students can also take classes at nearby Amherst, Mount Holyoke, and Smith colleges, as well as Hampshire for the immediate future. With 22,000 undergraduate and only 6,000 graduate students, UMass Amherst is truly an undergraduate-focused research institution. In fact, UMass is the third-largest research university in Massachusetts, trailing only Harvard and MIT, and the fourth-largest in all of New England. This means that there are many opportunities for undergraduates to get involved in research, in all academic areas. Unlike at small liberal arts colleges where professors may invite students to participate in research, UMass students may need to take the initiative and approach professors about opportunities; however, professors welcome that initiative, and there are more research areas to choose from at UMass than there would be at smaller institutions. With only 6,000 graduate students on campus, there are many opportunities for the 22,000 undergraduates to engage in research. In addition to the 117 majors offered at UMass, the BDIC (Bachelor’s Degree with Individualized Concentration) program allows student to create customized majors. They can design an interdisciplinary major by combining programs within UMass Amherst, and can include programs available through the Five College Consortium. Recent examples include: Marketing, Media, & The Political Process; and Culture, Brain, and Food Security – Access and Affordability. This year 2000 students from both in and out of state applied for 65 spots in the nursing program, resulting in a 12% acceptance rate. Accepted students had an average recalculated GPA of 4.2, ACT 31 and SAT 1380. If you choose nursing as your 1st choice major and are not admitted, you will not automatically be accepted for your 2nd choice unless you specifically tell them you will accept another major. One cannot transfer into the Nursing major and there is no Nursing minor. Explore specific programs and offerings at UMass Amherst. This is the next most competitive program at UMass, offering both a BA and a BS in computer science. The department is in the process of establishing a bachelor’s in informatics. Students from any major within the University are eligible to minor in computer science or information technology. Some students are admitted directly into the CICS major from high school, others might be invited to the CICS Exploratory Track and a few others can apply after being enrolled at UMass. Acceptance is based on academic performance in prerequisites and all other coursework. This year students accepted directly into the major had an average recalculated GPA of 4.1, average ACT 31 and average SAT 1320 (Math >629). Isenberg is ranked the best public undergraduate business school in the Northeast according to US New & World Report. 7200 students applied for 1000 spots this year. They offer a BBA in accounting, finance, management, marketing, and operations and systems management. A BS is offered in sports management and hospitality and tourism management. Sports management is one of the University’s most popular majors. 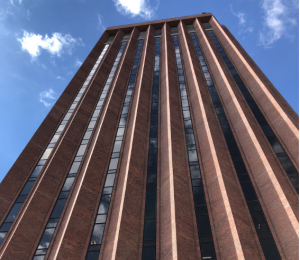 Like CICS, students can be admitted directly into Isenberg from high school, invited to join a business exploratory track or apply to transfer into an Isenberg major from within or outside the university (not easy). The College of Engineering offers seven ABET accredited BS engineering degrees including: biomedical, electrical, mechanical, civil, industrial, computer and chemical. There are multiple undergraduate research opportunities as well as clubs active in national competitions such as ASME Design and Rocket Team. Students do not have to know what specialty they want upon enrollment. As a first semester freshman, they can take an introductory engineering course which provides a broad overview of each area of study before declaring a specific major by the end of freshman year. 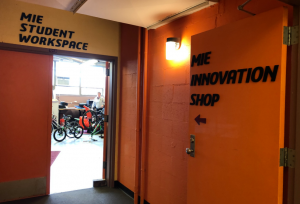 The College has its own makerspace and students have access to the machine room. About 500 students matriculate per year. Introductory lecture classes have 150-200 students with smaller break out discussion and supplemental instruction classes led by undergraduate and graduate teaching assistants. Class sizes become smaller after freshman year as students begin to specialize. Note there is an engineering management minor offered within Isenberg. 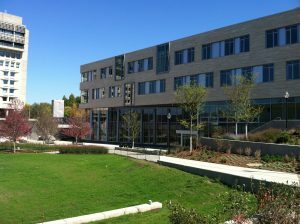 The CHC’s physical space consists of multiple modern buildings that offer housing, dining, faculty and administrative offices and classrooms in the heart of campus and adjacent to the newly renovated Recreation Center. 650 students are enrolled each year. Honors students can choose to live in CHC housing, enjoy an 18:1 student to faculty ratio, and can take at least one honors class every semester. Living and learning communities called Residential Academic Programs (RAP). RAP’s are available within CHC. Students who live together in a RAP take at least one class together as well. When students apply to UMass Amherst, they may be invited to the honors College. Invited students tend to be in the top 1-2% of their graduating class with an average SAT of 1470, ACT 33. Offers are extended across all majors at UMass Amherst so not all students are from the top programs. If you are not initially invited, you can apply after Nov 1st of your first semester; 80-90% of students with a GPA of 3.4+ in their first semester courses are accepted. Commonwealth Honors College encourages students to develop broad perspectives and engage in deep analysis through its four-year curriculum. An honors thesis or project is required and is the central component of honors work during senior year. The UMass campus can initially seem imposing with its eclectic assortment of architectural styles, but we found it quite manageable once we learned the dartboard analogy, picturing the tall DuBois Library at the center, surrounded by academic buildings in the next ring, then housing in the next ring, and parking in the next. Many facilities upgrades are in process, including a new student center. The new integrated science building and life sciences laboratories building have some of the most impressive laboratory facilities we have seen on any campus. The student body is very diverse, LGBTQ+ friendly, and espouses a motto of “Culture and Dignity.” We found students to be quite friendly, holding doors for each other and stopping to offer directions to visitors. As at most large state universities, on campus UMass Amherst housing is guaranteed for the first year, and students gradually transition to off-campus apartments in later years. Residence options range from high rise dorms to smaller and quieter brick buildings surrounding a grassy quad. Defined residential communities allow students who share a particular interest to live together, and many living and learning communities unite students who prefer quiet or substance free living, or who want to share a language, academic interest, or culture. Resident advisors and peer mentors are housed in every dorm. In 2018, for the third straight year, UMass Amherst was ranked No. 1 for campus dining in the nation by Princeton Review. The food is healthy, and sustainably sourced; we sampled and agree that it is delicious. The variety of dining options include a recently renovated food court with many ethnic options, traditional dining halls, cafes, and convenience stores distributed across campus. In addition to all the happenings on campus, UMass Amherst is within a ten-minute walk to the cute college town of Amherst, with many restaurants, shops and other attractions. We were impressed by the academic, social, and extracurricular opportunities available and encourage accepted students to appreciate all that UMass has to offer. Given the in-state cost of attendance of about $29,000, UMass Amherst is an option to be seriously considered.